MOSCOW, September 14. /TASS/. Turkey has not backed out of purchasing Russia’s S-400 anti-aircraft missile defense systems despite threats from the US, and Russia will fulfil the contract in 2019, according to schedule, said Russian Deputy Prime Minister Yuri Borisov. The US Department of State earlier reported that it might launch sanctions against any country that purchases S-400s from Russia. "I think that Almaz-Antey (which produces the S-400 systems - TASS) won’t have any problems with loading over the next ten years. Our traditional partner and, as you know, NATO member - Turkey - did not back out of this contract, despite all the threats from the United States. [Ankara] will receive its equipment according to schedule, in 2019, in accordance with our contractual obligations," Borisov specified. 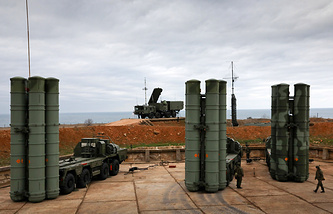 A military-diplomatic source told TASS earlier that Russian defense enterprises were ordered to complete the production of S-400 anti-aircraft missile defense systems in May 2019 for deliveries to Turkey. Turkey became the second customer for the S-400s after China. The signing of the contract was officially announced in September 2017. According to initial plans, the systems were going to be transferred to the Turkish side by early 2020. It later remerged that the deliveries would be fast-tracked at Ankara’s request. Borisov noted that Russia’s anti-aircraft missile defense systems are in demand worldwide. "We are proud to say that we’re global leaders," the deputy prime minister in charge of the defense industry stressed. The official stressed that the S-400s are not the only ones that are sought after. "The unique capabilities of the Pantsyr, the updated Buk-M3E, Tunguska, MPADS (Man-portable air-defense systems - TASS) are also in demand," he said.